A writer from New York City returns to his hometown of Jerusalem’s Lot, where he lived a terrifying experience as a boy. But he isn’t the only newcomers to town, as a couple of antique dealers aren’t exactly who they say they are. 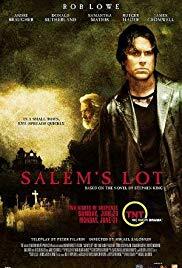 King’s classic vampire story Salem’s Lot was remade as a two-part story on TNT in the summer of 2004. 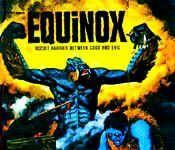 The movie was number one in programming both nights when it originally aired, beating basic cable by garnering four million viewers. It is a shame that cable programming doesn’t provide more original or adapted movies like Salem’s Lot, focusing instead on Sharknado or other fake reality shows. Mikael Saloman representation of Salem’s Lot was quite the pleasant surprise. If you’re looking for something that stays 100% true to King’s writing, this is definitely not for you. I tried not to rate the movie based on this factor, but I was taken aback by how many changes were made to the storyline. Otherwise, the script had a great pace. Being over three hours long, it is still easy to sit and watch the film in one sitting. The Marsden house looked great and the collection of characters was balanced both in terms of personality and screen time. Rob Lowe and Donald Sutherland were phenomenal catches and certainly had a part in carrying the film. In conclusion, Salem’s Lot (2004) has its pitfalls: tacky scenes with poor special effects and bad dialogue, but it was an enjoyable movie that’s worth taking a peak.